For the Kenyan guerrilla movement, see Mau Mau Uprising. The Mau was a non-violent movement for Samoan independence from colonial rule during the first half of the 20th century. Mau means 'opinion,' 'unwavering,' 'to be decided,' or 'testimony' denoting 'firm strength' in Samoan. The motto for the Mau were the words Samoa mo Samoa (Samoa for the Samoans). Similarly in Hawaii'an Mau means to strive or persevere, and is often linked with Hawaii'an poetry relating to independence and sovereignty struggles. The Mau movement's efforts would ultimately result in the political independence of Samoa in 1962 but the height of the movement's activity in the Western Islands occurred in the late 1920s and early 1930s. Exile Lauaki Namulau'ulu Mamoe (photo by Thomas Andrew). Broadly, the history of the Mau movement can be seen as beginning in the 19th century with European contact and the advent of Western powers, Britain, United States and Germany, vying for control of the Pacific nation. The country became German Samoa (1900–1914) followed by New Zealand colonial rule during which the Mau gathered national support. The dispute led to the eventual formation of a resistance movement called Mau a Pule on Savai'i by Lauaki Namulau'ulu Mamoe, one of the Samoan leaders from Safotulafai who was deposed by the German Governor of Samoa, Wilhelm Solf. As well as deposing members of the Malo o Samoa, Solf called in two German warships as a show of strength. Lauaki returned with his warriors from Savai'i for battle. The German governor convinced Mata'afa to set up a "peace talk meeting" with Lauaki but that Lauaki had to disperse his army before the meeting. Unbeknown to Mata'afa was the intent of the German governor to rid of Lauaki. Lauaki, a man of honor, returned with his warriors to Savai'i as they were reluctant to leave Upolu without him. 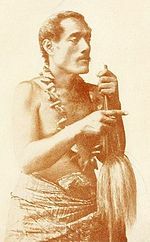 After ensuring his warriors' arrival to their villages, Lauaki returned to Upolu. As it took Lauaki several days to disperse his army, the German governor set up his trap. Days later upon their return to Upolu, Lauaki and some of the Chiefs were betrayed at this "peace talk", held aboard the German ship. In 1909, Lauaki and the other senior leaders of the Mau a Pule were exiled to the German colonies in the Marianas (North West Pacific) where they were to stay until 1914, when New Zealand took over Samoa as part of its Empire duties at the outbreak of World War I. Many of those exiled died before returning to Samoa. Lauaki died en route back to Samoa in 1915. The Mau published the Samoa Guardian newspaper as a mouthpiece for the movement. To demonstrate the extent of popular support for the Mau, Nelson organised a sports meeting for movement members on the King's Birthday, in parallel with the official event, and held a well-attended ball at his home on the same night. Movement members had begun to engage in acts of noncooperation: neglecting the compulsory weekly search for the rhinoceros beetle, enemy of the coconut palm, thereby threatening the lucrative copra industry. When New Zealand administrators imposed a per-capita beetle quota, many Samoan villages resisted by breeding the insects in tightly-woven baskets rather than comply with the orders to scour the forests and collect them. Following another visit to New Zealand to petition the Government, Nelson was exiled from Samoa along with two other part-European Mau leaders, Alfred Smyth and Edwin Gurr. The petition, which led to the formation of a joint select committee to investigate the situation in Samoa, quoted an ancient Samoan proverb: "We are moved by love, but never driven by intimidation." With his attempt at repression turning to ridicule, Richardson offered pardons to all those arrested; however, arrestees demanded to be dealt with by the court, and then refused to enter pleas to demonstrate their rejection of the court's jurisdiction. On 28 December 1929 — which would be known thereafter as "Black Saturday" — New Zealand military police fired upon a peaceful demonstration which had assembled to welcome home Alfred Smyth, a European movement leader returning to Samoa after a two-year exile. Reports of the massacre are sketchy because the official cover-up for the incident was so effective. Tupua Tamasese Lealofi III had rushed to the front of the crowd and turned to face his people; he called for peace from them because some were throwing stones at the police. With his back to the police calling for peace he was shot in the back; another Samoan who rushed to help him was shot in both legs while cradling his head. Another who had attempted to shield his body from the bullets was shot. Two more rushing to help were killed before they could reach him. Fiame Mata'afa Faumuina Mulinu'u II (1921–1975), the son of another high chief and Mau leader Mata'afa Faumuina Fiame Mulinu'u I, became the first Prime Minister of Samoa. The Mau movement was an indigenous opposition to the U.S. annexation of the eastern Samoan islands in 1899, and had manifestations in both the Western and Eastern Samoan island groups. It featured the signing of petitions in efforts to enact political transformation vis-a-vis American colonial government, and included effort to resist taxation of copra. There was an American Samoa Mau that took place in Tutuila in American Samoa in the 1920s. It emerged as a result of fluctuating prices of copra and represented an open affront to the American Navy and its patterns of treatment of the indigenous Samoan people and failure to respect Samoan customs, conceptions of self-government and the Samoan way of life. This movement received a lot of press in the United States, both favourable and unfavourable. The leader of the movement, Samuel Ripley of Leone, Tutuila, was in effect exiled from American Samoa, when he was barred by the US Navy authorities from disembarking from a ship returning to Pagopago from California, and he was never allowed to return to his homeland. He eventually became the mayor of Richmond, California. 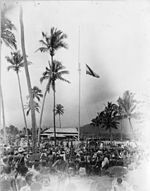 The United States sent a committee to American Samoa in 1930, including US citizens from Hawaii who had a prominent role in the overthrow of the Kingdom of Hawaii and Queen Lili'uokalani. Their report, favourable to the US position, had a considerable influence on US policy, and the American Samoa Mau was totally suppressed by the US. Its influence however continued to be felt. 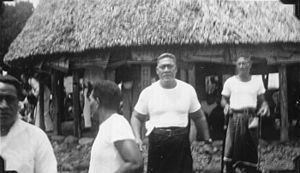 ^ "The rise of the Mau movement - NZ in Samoa | NZHistory.net.nz, New Zealand history online". Nzhistory.net.nz. Retrieved 1 September 2010. ^ Furnas, JC (2008). Anatomy of Paradise - Hawaii and the Islands of the South Seas. Read Books. p. 345. ISBN 1-4437-2767-9. Retrieved 21 February 2010. ^ "New Zealand in Samoa". New Zealand History Online. Retrieved 21 February 2009. ^ "Samoa". State.gov. 15 April 2010. Retrieved 1 September 2010. ^ "Apology to Samoa surprises New Zealand". BBC News. 4 June 2002. Retrieved 12 May 2010. ^ "Emotions high as Clark seeks closure in Samoa - Tapu Misa - NZ Herald News". Nzherald.co.nz. 5 June 2002. Retrieved 1 September 2010. Chapell, David. "The Forgotten Mau: Ant-Navy Protest in American Samoa, 1920-1935." Pacific Historical Review 69.2 (2000): pp. 217–260. Field, Michael J., Mau: Samoa's Struggle Against New Zealand Oppression. Reed Publishing, 1984.